For those who may want to do more than just relax in, on and around the lake, the area provides a variety of indoor and outdoor entertainment choices. The area has some spectacular mountain golf. The area’s parks are a national treasure and great for a scenic drive, hiking, biking and picnics. Visit the National Park Service for more detailed information. A 2,160 mile foot trail along the ridge crests and across the major valleys of the Appalachian Mountains from Katahdin in the central Maine wilderness to Springer Mountain in a designated wilderness area in north Georgia. Crossing the Cherokee and Nantahala National Forests from Robbinsville, NC to Tellico Plains, TN. 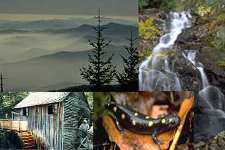 Established in 1934, covers 520,408 acres of land with heights ranging from 840 feet at Abrams Creek to 6,643 feet at Clingmans Dome. A tribute to a hero whose poem “Trees” inspired millions. The Forest Service inauguarated the Little Santeelah as the Joyce Kilmer Memorial Forest in 1935. The byway begins in Highlands traveling approximately 61 miles winding through southern Appalachian hardwood forests, by numerous waterfalls and lakes and through two river gorges. The foret lies in the mountains and valleys of western North Carolina with elevations as high as 5,800 feet at Lone Bald in Jackson County, to a low 1,200 feet in Cherokee County along the Tusquitee River. DollyWood Pigeon Forge, TN – escape to the unique world of Dolly Parton’s Smoky Mountain theme park. Lake Winnepesaukah Chattanooga, TN (877) 525-3946 – rated as one of Americas Top 10 family amusement parks by Travel and Leisure magazine. Boat registration and fishing licenses for in-state and out-of-state visitors can be purchased online at the North Carolina Wildlife Resources Commission’s web site or by calling (888) 248-6834. Georgia Mountain Fairgrounds plays host to several popular annual events including the Georgia Mountain Fair, the Superstar Concert Series, the Georgia Mountain Fall Festival and Georgia’s Official State Fiddlers’ Convention. Unto These Hills Cherokee, NC – An outdoor drama telling the tragic story of how the Cherokee ancestors were forcefully driven out of the Great Smoky Mountains and marched 1,200 miles to Oklahoma. Cherokee County NC – includes the towns of Murphy, Andrews and Brasstown. Come find your “peace” of the mountains. Gatlinburg, TN – The Heart of the Smokies. 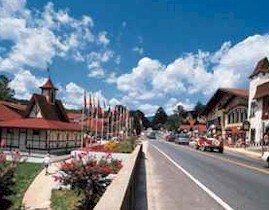 Helen, GA – re-creation of an alpine village famous for Oktoberfest. Pigeon Forge, TN – one of the fastest growing tourist cities in the South. Biltmore Estate Asheville, NC (800) 543-2961 – built on a 125,000 acre (now 8,000 acres) estate as the home of George Vanderbilt, the 250-room French Renaissance chateau known as Biltmore House is the largest private residence in America. Blue Ridge Scenic Railway Blue Ridge, GA (800) 934-1898 – 26 mile tip along the Taccoa river in vintage passenger cars. Fields Of The Wood Murphy, NC (828) 494-7855 – visit biblical monuments, replicas of Golgotha and Joseph’s tomb and the world’s largest set of the Ten Commandments. Great Smoky Mountains Railroad (800) 872-4681 – train excursions through western North Carolina mountains. Rock City Lookout Mtn, GA – Experience Rock City and view 7 states from atop Lookout Mtn. Ruby Falls Chattanooga, TN – America’s highest underground waterfall open to the public. Tennessee Aquarium Chattanooga, TN – visit the world’s largest freshwater aquarium. Enjoy both guided and unguided trips on the Nantahala River or guided trips on the more challenging Ocoee River, site of the 1996 Olympic kayak competitions. Rolling Thunder River Company (800) 408-7238 – Ocoee or Nantahala river trips. Wildwater Ltd. Rafting (800) 451-9972 – Ocoee or Nantahala river trips.